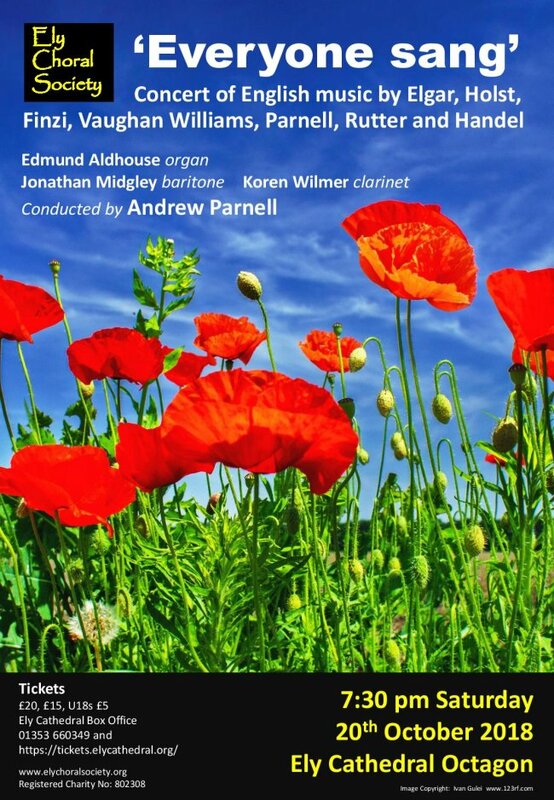 In this concert we will be celebrating English music – the concert title is taken from Siegfried Sassoon’s poem on the signing of the Armistice in 1918, bringing peace after World War I, very much in people’s minds 100 years later. Some of the works are by composers who lived through or served in the war, and they are balanced by Handel who wrote anthems for the coronation of George II and two living composers, John Rutter and Andrew Parnell. We have grandeur in Elgar’s Give unto the Lord; joy and tenderness in Vaughan Williams Five Mystical Songs; characteristic re-workings of hymn-tunes in Two Psalms by Holst; profound spirituality in Finzi’s Welcome Sweet and Sacred Feast; and the majestic splendour of Zadok the Priest. Couple these with the unusual addition of a clarinet to the accompaniment of John Rutter’s The Lord is my Light and my Salvation, the first performance of Andrew Parnell’s Everyone Sang, also accompanied by clarinet and organ, and the skills and virtuosity of the baritone Jonathan Midgely, the clarinettist Koren Wilmer and the organist Edmund Aldhouse, and we can look forward to a true celebration of English music.